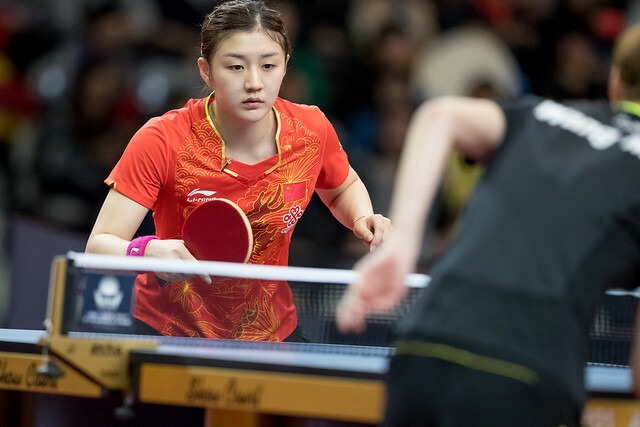 The final session of play on Tuesday 4th July at the Seamaster 2017 ITTF World Tour Australian Open in Gold Coast maintained the theme of Japanese stars struggling. Tristan Flore of France sensationally knocked out the no.2 seed Japan’s Koki Niwa in the Men’s Singles event. Flore led from beginning to end, taking out the match in six games (11-4, 11-7, 5-11, 11-3, 8-11, 11-7). The trend continued as Japanese wonder-kid Tomokazu Harimoto was quickly dispatched by Korea’s Lim Jonghoon in straight games (11-6, 11-3, 11-7, 11-6). Harimoto looked a shade of his usual self as Lim Jonghoon powered through the usually tenacious teen. Meanwhile, Japan’s Yuya Oshima came back from three-nil down to defeat India’s Amalraj Anthony in seven games (8-11, 7-11, 5-11, 11-7, 11-7, 11-5, 11-7) and put a stop to a seemingly invincible Indian team. On the other side of the stadium England’s Paul Drinkhall took control of his match against Russia’s Alexander Shibaev notching up a four-two win (11-7, 11-9, 8-11, 3-11, 11-8, 11-7). With the Commonwealth Games being held on the Gold Coast next year, Drinkhall is also using this as a chance to make himself at home in the area. Checkout the full results from today’s Men’s Singles matches here.